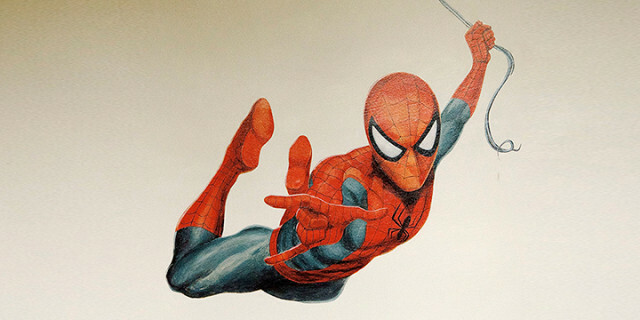 This children’s Spiderman mural was painted for a 6 year old boy’s bedroom in 2012. Spiderman is a popular choice for younger and older children. Have a look at some of my other murals for more ideas. The absence of background allows the figure to look as though he is swinging across the room! Just painting a figure on a plain wall also means the mural is quicker to paint. If you decide that you would like a mural painted for your child the easiest way to get a price guide is to contact me by email or call me on 07815 027610. I can then give you an idea of the price, if you then would like to commission a mural I can arrange to visit you to see the room and to discuss ideas.